The United Construction Workers Association (UCWA) was founded in 1970 by Tyree Scott, an electrician who had become a Seattle civil rights activist. At the request of the American Friends Service Committee, Tyree Scott left the Central Contractors Association which he had created in 1968, to found the UCWA with the goal of uniting minority construction workers to promote their employment in the construction industry and prevent discrimination. The UCWA negotiated on behalf of black workers, led protests, initiated lawsuits, and organized worker support groups. The impetus for the UCWA came on June 16th, 1970,when Federal District Court Judge William Lindberg ruled in U.S. v. Ironworkers Local 86 that four local unions in Seattle were in violation of Title VII of the 1964 Civil Rights Act. His order created one of the first affirmative action programs in the U.S. involving union workers. Lindberg formed the Court Order Advisory Committee (COAC) to oversee the implementation of the program in Seattle. Scott hoped the ruling would help black workers gain employment in the local construction industry. The COAC, however, voted to exclude Scott from oversight in the hiring of black workers following accusations by Scott that the COAC allowed union hiring halls to undermine the affirmative action program. In response the newly formed UCWA under Scott organized and led a series of direct action protests. During the summer of 1972, the UCWA closed down a number of area construction sites including Interstate 90 and the Seattle Central Community College. In response, the COAC gave the UCWA two representative positions in addition to power in union apprenticeship programs. The UCWA would be an active member of the COAC until the Committee disbanded in 1978. The UCWA expanded beyond Seattle in 1971 to include cities such as Oakland, Denver, and Little Rock. 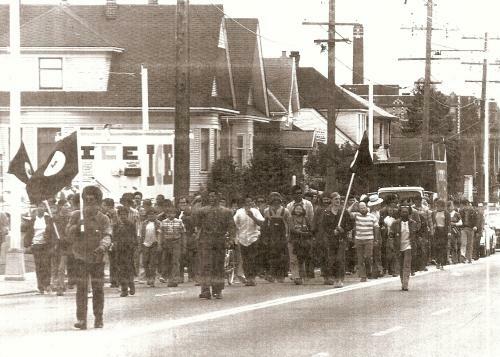 In addition, the Alaska Cannery Workers Association (ACWA), a predominately Filipino labor union, received seed money and training from UCWA in 1973. Also in 1973, the UCWA, the ACWA and the Northwest Chapter of the United Farm Workers came together to form the Northwest Labor and Employment Law Office. Several leaders from the UCWA coordinated the Seattle Workers Group (SWG), a Marxist organization, from 1973 to 1980. The SWG in turn encouraged both unionization and radical politics in a number of cities across the country through the Organizing Committee for an Ideological Center. From 1975 to 1978, the UCWA published No Separate Peace, a newspaper which explored Seattle’s issues in the context of a global critique of racism, imperialism, and sexism. The UCWA slowly started to fade away in the late 1970s as members began to focus more on the activities of the Northwest Labor and Employment Office. Shortly after the COAC disbanded in 1978, No Separate Peace stopped publication, and federal funding for UCWA was curtailed. The UCWA stopped operating as an organization around the end of 1980, but the Northwest Labor and Employment Office still operates out if its Seattle office. Seattle Civil Rights and Labor History Project, “Special Section: United Construction Workers Association,” http://depts.washington.edu/civilr/ucwa.htm; Letter to UCWA members from Lionel Hampton and Tyree Scott, 29 July 1970, Box 10, Location C2785e, Accession # 5-45-001, Tyree Scott Papers, Archival Materials, University of Washington Special Collections; American Friends Service Committee, “An Issue Whose Time Has Come: Minority Employment in the Seattle Construction Industry,” 5 February 1970, accessed online at http://faculty.washington.edu/gregoryj/civilrights/idea.pdf.